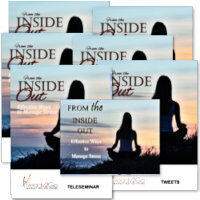 Audio Training Program: From the Inside Out - Effective Ways to Manage Stress from Ready2Go Marketing Solutions, Inc.
You want to make sure you handle it as soon as possible, because its effects can impact you in all kinds of negative ways. If you want to live a long, rewarding and healthy life, you must learn to effectively deal with the many types of stress you encounter. In this audio series we’ll explore all of these things so you can be as informed as possible and take the necessary actions to be stress-free as soon as possible – or at least have less stress! Each 5-7 minute audio will give you some excellent information and advice on what stress is, what it can do to you and how to minimize it. Learn about different types of stress - productive tension (good stress) and distress (bad stress). Discover the 4 different and equally debilitating categories of stress and presumably notice some of them in your life. 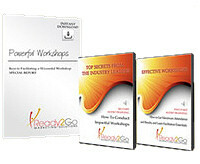 Learn how to reduce stress in work, relationships, and by taking care of our personal well being. Be amazed out how men and women uniquely respond to stress. Discover how to spot burn-out and stop it before it’s too late. Get tips on how to keep your stress levels under control when others you are dealing with are stressed out.